ASVEL announced signing of Clifford Hammonds (191-G-85, college: Clemson) for the upcoming season. 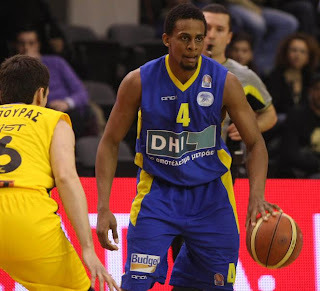 The 24-year old guard is coming to ASVEL from Greek DASH Peristeri Athens. With them Hammonds appeared 26 times in domestic championship averaging 12.9 points, 3.1 rebounds, 3.7 assists and 1.5 steals. Peristeri finished the season as No.9 with 12-14 score. They were in circle with Aris and Panionios, but had the worst numbers and failed to reach the Playoffs. Before Peristeri, Clifford Hammonds played in Puerto Rico for the Quebradillas Pirates. He appeared 11 times in BSN averaging 14.2 ppg, 2.1 rpg, 5.7 apg. The Pirates reached BSN Finals. Season 2008/09 he started with Darussafaka and in December joined Efes Pilsen. With the Turkish giant he played just five games before was sent back to Darussafaka. In TBL Hammonds had 14.0ppg, 3.8rpg, 3.9apg, Steals-5 (2.0spg) in 26 games. Clifford Hammonds graduated at the Clemson University in 2008. At his senior season Hammonds had 11.4ppg, 4.1rpg, 3.9apg, 1.9spg, in 24 games. As a junior his number was pretty close.